The Himachal Cabinet today decided to create 3,163 posts in various departments and introduce a vocational scheme for the rehabilitation of persons with disabilities. Even as the two CPM councillors abstained from voting, Narinder Kataria was elected mayor of the local municipal corporation here today. The BJP councillors who had staged a walkout yesterday took oath. A 26-year-old devotee from Uttar Pradesh tried to offer his head at the Jawalamuhki shrine, one of the 52 Shakti Peeths, late last evening. Four policemen were assaulted by some miscreants near petrol pump here around 11.30 pm yesterday. In the absence of basic amenities, Baijnath, which was accorded the status of subdivisional headquarters in 1995, is fast turning into a slum. The BJP said today that Chief Minister Virbhadra Singh should resign owing moral responsibility for the defeat of the Congress in the Hamirpur Lok Sabha byelection. Even as the villagers whose land is being acquired for the proposed "pooling station" of transmission lines being set up by the Power Grid Corporation of India at Banala village, about 40 km from here, the mahila and yuvak mandals of the surrounding villages today tied symbolic rakhis on the trees at the site, resolving to protect them at any cost. Damage worth crores of rupees was caused to the 990-MW Dehar Power House due to fire on Sunday night. Delegates of different organisations and residents of the Kharwari Chambi area celebrated the World Environment Day at Kharwari Chowk. Even as forest authorities await clearance from the Ministry of Forest and Environment for felling of 31 trees, the state Cabinet today granted approval to the Jakhu aerial ropeway. Priya was crowned Miss Shimla at a glittering function held during the Shimla summer festival here last night. The Himachal government will not allow hydroelectric projects and industrial units to come up at the cost of environment. The Cabinet gave its nod for the creation of 548 posts in Indira Gandhi Medical College, Shimla, and making a provision for 441 more posts to be filled over the next four to five years to help the college deliver specialised medical services. Besides, 2,096 posts of teaching and non-teaching categories were created for the newly upgraded 16 senior secondary, 71 high and 106 middle schools. Two posts of additional advocate-general and one post of deputy advocate-general, one post of joint secretary, two posts of deputy secretary and six posts of section officer in the Himachal Pradesh secretariat, four posts in the Himachal Public Service Commission. As many as 48 posts were also cleared for the millennium polytechnic, Chamba. In the Education Department 336 teaching and non-teaching posts were created for newly upgraded 16 government senior secondary schools, 438 posts for upgraded 45 middle and 34 high schools. Besides the regularisation of 690 JBTs with eight-year regular service as on December 31, 2006, in addition to 1,693 regularised earlier, was also cleared. Of the 690 approved for regularisation 393 have been granted relaxation in educational qualifications and 20 in the age limit. The Cabinet decided to appoint the respective deputy commissioners as secretaries of the the district planning committees to ensure proper co-ordination among all departments in preparation of the district development plans. It decided to introduce a vocational scheme for the rehabilitation of persons with disabilities. It sanctioned the opening of a SDO (Civil) office at Paddhar in Mandi and a new tehsil for Nagrota-Bagwan in Kangra district. It granted approval for purchase of bulk supplies of goods by government departments, corporations and boards within the state by delegating powers. It granted recognition to the diplomas and degrees awarded by the extension centres of the universities and deemed universities as one-time relaxation from June 1, 2001, to August 31, 2005 making them eligible for employment in the Elementary Education Department. One-time relaxation from eight years to five years in the service conditions for promotion of deputy forest rangers as range forest officers was granted with relaxation in educational qualifications. Further, a reservation of 15 per cent was granted for home guards for recruitment as policemen, forest guards and jail wardens with relaxation of age from 20 to 28 years. They later participated in the voting to elect the mayor and the deputy mayor. The BJP had put up Pradeep Kashyap and Manju Sood as its candidates for the posts of mayor and deputy mayor. With the two CPM councillors choosing to abstain from voting, the Congress candidates for the two posts got 15 votes while those of the BJP polled eight votes each. Out of a total of 25 councillors, the Congress has a majority with 15 while the BJP has eight and CPM two councillors. Harish Janartha was elected deputy mayor. Kataria happens to be the seniormost councillor in the Congress as this is his third term. Going strictly by the seniority criteria, the Congress decided to give him the top post in the prestigious MC. He won from the Benmore ward of the town. On the other hand, Janartha is a second-term councillor who won from the Engine Ghar ward. While Sohan Lal was the mayor in the last MC, Shashi Shekhar was the deputy mayor. This is for the fifth consecutive term since 1986 that the Congress has retained its hold over the Shimla MC. The two CPM councillors abstained from voting as the party has been opposing the policies of both Congress as well as the BJP. Shimla district secretary of the CPM Sanjay Chauhan said the party had decided to stay away from the elections as they disagreed with the anti-people policies being pursued by the Congress and the double standards of the BJP. He slit his throat with a sharp-edged weapon. He was later identified as Jagat Pal, a resident of Abdullah Badi village of Shahabad tehsil in Uttar Pradesh. He had come to the shrine alone. Jagat Pal said he wanted to behead himself at the feet of the goddess like Dhyanoo Bhagat, who sacrificed himself at Nagarkot Dham of Bajjreshwari in Kangra. According to the eyewitnesses, Jagat Pal paid obeisance at the temple and meditated there for some time. He then reached the dome of the temple by a staircase and slit his throat saying “Jai Mata Di”. Both his windpipe and food pipe were cut. He was taken to Jawalamukhi Hospital where he was operated upon and saved. No case has yet been registered against the devotee. A police party was returning after patrolling when it was attacked by residents of a nearby locality. These persons were carrying iron rods, lathis and pipes. The incident took place after a scuffle between the police party and four boys of the area who were allegedly under the influence of liquor and had blocked the main road by parking their motorcycle in the middle of road. Inspector Khazana Ram, SHO of the Nahan police station, sub-inspector Subhash Chand, driver Rajender Singh and constable Naseeb Chand were badly thrashed by around 20 persons. They suffered head injuries and other multiple injuries on different parts of the body. SHO Khajana Ram, however, managed to reach district hospital with his injured staff members by driving the van himself. After reaching in the hospital, he informed additional SP Rani Bindu Sachdeva and SP R.P. Singh, who was in Shimla in connection with some departmental meetings. Additional SP reached the hospital with a police party and supervised the medical aid being given to the injured. Condition of three police personnel was stated to be serious. Constable Naseeb Chand had received severe head injuries and his condition was stated to be critical. He was referred to the PGI, Chandigarh, after giving first aid at the district hospital here. Rest of the injured were being treated here only. One of them had been kept under active observation due to severe head injuries. A police party led by Sirmaur’s Additional SP Rani Bindu Sachdeva combed the area around the petrol pump and rounded up three persons in connection with the incident. Overflowing drains, contaminated drinking water, potholed roads and streets tell the tale of the town. Due to overflowing drains, water gets accumulated in streets spreading stench all around. People find it very difficult to move around in these streets. Some of the paved streets have got damaged because of regular overflowing of drains and leakage from drinking water pipes. Garbage can be seen lying here and there. The absence of sewerage system has led to insanitary and unhygienic conditions that often lead to health problems. Some of the localities have been reduced to virtual slums. There is an urgent need to lay sewerage as the prevailing conditions are alarming. The town is also faced with shortage of potable water. There is a general complaint that the water being supplied to the residents is often muddy and not fit for human consumption. The narrow Pathankot-Mandi national highway that passes through the town has also become a major problem for the residents because of frequent traffic jam. Despite repeated requests, the state government has not cleared the project for the construction of a bypass. Chief Minister Virbhadra Singh had announced a number of plans for the development of the town, but these are yet to be implemented. At present, the town is being governed by a panchayat that has no funds to keep it clean. There has been a manifold increase in the population of the town over the past five years and the panchayat is finding it difficult to maintain the town with meagre funds allotted to it every year. The long-standing demand of the people to set up a municipal council has not been accepted. Residents have been urging the authorities to put in place a municipal council for Baijnath and Paprola towns. The comprehensive win of the BJP in the crucial byelection to the Hamirpur parliamentary constituency has set the alarm bells ringing for the ruling Congress in the hill state with the Assembly poll due in February, 2008. The margin of defeat apart, the fact that the Congress could gain lead in only two of the 17 Assembly segments falling under the parliamentary seat, clearly indicates which way the wind is blowing. It has also revealed the extent of the anti-incumbency factor as a result of which the party has lost much ground over the past four years. At present eight constituencies are held by Congress legislators. 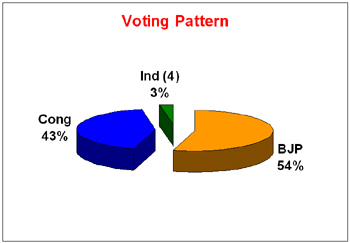 In the May, 2004, Lok Sabha poll when BJP candidate Suresh Chandel won by a slander margin of 1,625 votes the Congress led in 12 segments. Hamirpur has been a traditional stronghold of the BJP but the magnitude of the defeat is an unmistakable pointer to the changing mood of the electorate. The outcome of the byelection has more than neutralised the psychological advantage the Congress had gained by winning the Shimla Municipal Corporation. The euphoria of victory has evaporated and ground realities are staring the party in the face. As 13 of the Assembly segments under the seat fall in the merged areas the result also reflects the growing anti-Congress sentiments in the lower hills. The signals are ominous for the ruling party, particularly Chief Minister Virbhadra Singh, on whom the party has been banking for the coming Assembly elections. His detractors led by former minister Vijay Singh Mankotia, who has been raising the issue of discrimination with the lower hills and corruption for the past two years, will step up their campaign against him. In fact, it was the explosive audio CD released by Mankotia, which took the wind out of the Congress sails in the crucial final phase of electioneering, and caused irreparable damage to the party's prospects. Mankotia had also threatened to come out with more such exposures if the party high command fails to replace Virbhadra Singh as the Chief Minister. Now that Virbhadra Singh is on a sticky wicket, it remains to be seen what course of action Mankotia adopts. The Congress could no longer draw comfort from the factional fight in the BJP between rival camps headed by two senior leaders Shanta Kumar and P.K. 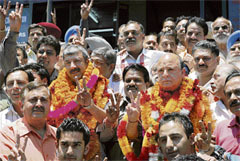 Dhumal as the former campaigned vigorously for the success of the latter in the byelection. Indeed, the byelection has united the BJP and consolidated its vote bank in the Kangra region which augurs well for the party in the Assembly poll. Further, infighting in the Congress is bound to intensify as the detractors of Virbhadra Singh, who have been lying low till now, will start gunning for his scalp. He is in for a tough time. In a statement issued here today, state party chief Jai Ram Thakur said that in view of the Congress defeat after the release of the audio CD against Virbhadra Singh, the Chief Minister should step down. He said people had voted against the Congress because of the issues like price rise, unemployment and a slow pace of development. The activists are being mobilised by the Himalayan Paryavaran Abhiyan. Leela Thakur, pardhan of the Banala Mahila Mandal, warned the government that they would never allow the trees to be cut down for the project. Ironically, the villagers whose land is being acquired have expressed full support to the project, stating that the land is barren and shady and the project would provide jobs to youth of the area. Claiming that there was no alternative site available for the pooling station, Powergrid Corporation officials said the villagers had given their consent for the project. Two transformers were gutted as a fire broke out due to a short circuit, official sources said. According to officials of the BBMB, the fire was noted around 2.50 am on Sunday night and five-fire tenders took about two hours to control the fire. The power house could not generate electricity for about eight hours. The power house is still not functioning to its full capacity as in August last year, water had entered the power house due to which damage was caused. Last year the power house was out of order for about three months and till date only three generators out of six were functioning. The enquiry regarding the incident was going on to ascertain the cause of fire. 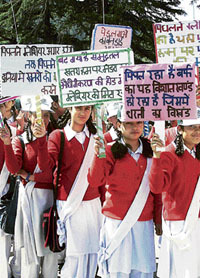 The local residents accused the BBMB officials of negligence in duties. They were all against setting up of the cement plant near Sundernagar and demanded to shift the project site. The function was attended by hundreds of residents and delegates from different organisations. The government’s move to set up the plant at the present site was criticised. According to them, the cement industry had already caused environmental damage to the state and still the government was signing MoUs with different business houses indiscriminately, which was not in the interest of the state. Noted environmentalists Sunder Lal Bahuguna (Chipko movement), Medha Patkar (Narmada Bachao Andolan) Ashok Chaudhary (Rashtriya Van Shram Jivi Manch), Raj Chopra (Ekta Parishad) and many other noted environmentalist will be visiting the area near in support of the demand. Those who spoke on occasion were Gumana Singh form Himalayan Bachao Samiti, Amar Singh Ragwa, Himanchal Kishan Sabha, Lavan Thakur, Indian Puble Theatre Association, Amar Chand Verma, environmentalist, Makarr Dwaj, Kashav Sharma, Roshan Lal Chauhan and Lalit Chaudhary and delegates of local bodies. The nod was given on the condition that it would come up strictly in accordance with the concession agreement signed with the Tourism Department. The Cabinet which met here today examined the much delayed Jakhu aerial ropeway project which had been granted to Jagson International. The Cabinet decided that the company would not be allowed to construct the proposed 11-storeyed building, but only need-based structure would be allowed to come up. The Cabinet decided that as per the concession agreement signed with Jagson International Ltd, the company will be allowed to have a built up area of only 700-sq m and not a multi-storeyed structure in the green no-construction zone. The company intended to a have 2,762-sq m of built up structure near Shiwalik Hotel. As many as 15 participants sashayed on the ramp as they vied for Miss Shimla crown. While Priya won the crown, Tashi was adjudged the first runner-up and Priti Thakur the second runner-up. Priya also won the title for miss personality, while Tashi won the best catwalk prize. Second runner-up Priti Thakur was given the most photogenic face title. The participants walked the ramp in sarees during the ethnic wear round and later in western outfits. Six participants were shortlisted for the question and answer round after which the winners were announced. Despite a lot of craze among the audience to see the fashion show, presented by models from Delhi, it turned out to be quite a disappointment. Presiding over a function to mark World Environment Day here today, Chief Minister Virbhadra Singh said the government had abandoned big and small hydroelectric projects with a total generation capacity of 425 MW in Kullu and Kinnaur districts due to its concern for preserving the environment. Besides, it had also made it mandatory for every hydroelectric project to release a minimum of 15 per cent discharge in the river water downstream beyond its dams for the sustenance of aquatic life and water supply and irrigation schemes. He said the government had decided to abandon almost all hydroelectric projects in the Tirthan valley of Kullu district to save trout, which formed a vital component of the local ecological system. Similarly, a number of projects were being abandoned in Kinnaur district to conserve the vanishing the "bhojpatra" forests in the area. Virbhadra Singh said that Himachal happened to be the first state to constitute a separate department look after environment. The government had already banned green felling and use of recycled polythene bags and reiterated the commitment of his government to executing the Catchment Area Treatment (CAT) plans in all identified areas on priority. Power Minister Vidya Stokes, who also holds the charge of environment, expressed concern over the disastrous effects of e-waste which was increasing tremendously with the advancement in technology. Nahan: The role of the local eco club in enlightening the masses about the importance of environmental safety is praise worthy. Every citizen should discharge their duty in protecting the environment, said the Deputy Commissioner R.S. Negi on Tuesday while addressing a rally on the World Environment Day.